I always enjoy browsing other bloggers' WIP Wednesday posts, but I never wanted to jump directly onto that bandwagon. I was more interested in an adjacent bandwagon--something just a bit different. Of course, when you're showing off half-finished knitwear, there's not a whole lot you can do to stand out. Blobs of knitting look like blobs of knitting. So that leaves me with little more than a name change. But I will soldier on nonetheless. 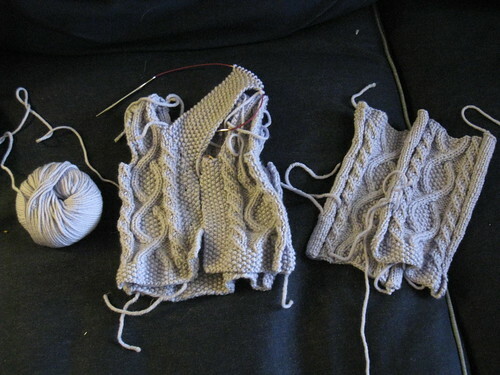 As in, theoretically, the following blobs of knitting will someday actually be something. This project has been on the needles since the dawn of time. Or so it seems. 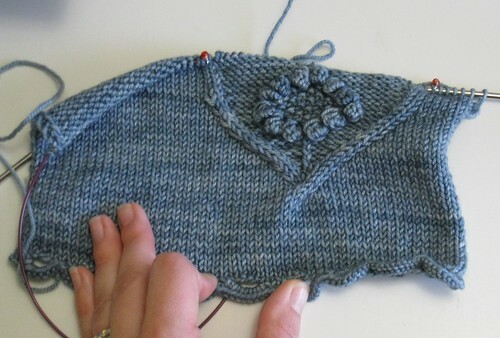 This is a Trellis baby sweater. When the month started, I had a finished body and one sleeve, but had little motivation to knit the second sleeve because I'd already had to knit the first sleeve twice (which I blame on the myriad possible interpretations of the phrase "as established"). But the baby the sweater is intended for made his debut last week, so I bravely pushed forward, and now have a 2nd sleeve and have started in on the collar. A quick note on this one: the seed stitch pattern is shown as "k1, p1," but for the sleeves, you need to start with a purl stitch, or the cuff won't transition into the cable section correctly. This one is a new project, and another from Knitty: the Achilles Heal socks, which have a unique construction--the leg and foot of the sock are completed first, then you go back and do the heel and gusset. 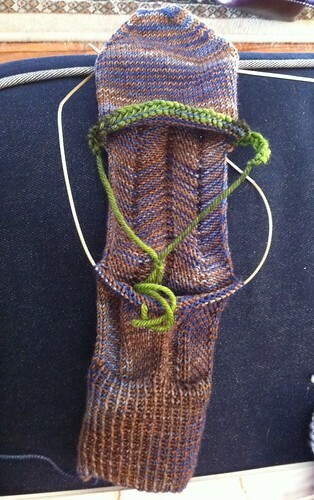 This, theoretically, enables you to replace this section in its entirety if it wears out before the rest of your sock. My sock currently has a gaping hole in the middle for this reason. It's certainly an interesting idea, but I don't know if it's worth all of the extra fiddling and futzing (moving stitches to waste yarn, provisional cast-ons, etc.). Time will tell. And last, but certainly not least, the Wildflower Cardigan! So far, so good--my only concern is that curling on the bottom edge, which I sincerely hope will block out. In other news, I've decided to start playing on Twitter. You can follow me at @mediaperuana. Will I have anything interesting to say? I sure hope so.